Two Bears Farm and the Three Cubs: Happy Fourth! Maybe he isn't red, white, and blue, but he is some of the most spectacular colors I've seen in nature. Taken at the Greensboro Science Museum last week. Happy July 4th folks! I hope you have a great one! thanks for the comments -- i have been so terrible with blogging, it made me smile to hear from you : ) i still read blogs more than i write or comment myself. trying to get caught up some ...... isn't it crazy how our kids are growing, getting taller and older looking?!!!! Gorgeous photo. Happy Fourth to you and your family. He is amazing! I hope you have wonderful 4th. Happy 4th Lisa ! I hope you have a wonderful day !!! They are just beautiful when they spread their feathers. We see a lot of them walking around St. Augustine. That is a beautiful bird! Have a safe and happy celebration today! Beautiful peacock! Hope you and your family have a wonderful 4th! No, not red, white and blue but natures certainly gave us some great fireworks when he was created! AWESOME!!!!! And he is nature's fireworks! What will you guys be doing this evening? Setting off your own or going somewhere? It costs SO much to buy enough for about fifteen minutes! I know you probably already have your plans. But did you know about the big hot air balloon festival with bouncies and things for the kids? Lots of balloons take off, and you can get tethered rides, the boys could watch as they put the got air and take off. In Lexington at VMI parade field, I bet that is too far away for you at the last minute but just wanted to tell you, they have it every year. GOSh I'm just thinking we could have made plans to meet there!!! Let me know if you are going and we can get together. Great photo Lisa! Happy 4th to you and your family too! Spectacular peacock! Great photo. Have a happy Independence Day, Lisa,and have fun with your family! Hope you are having a GREAT day. Happy July 4th. What kind of camera? What lens did you use? That is amazing looking! 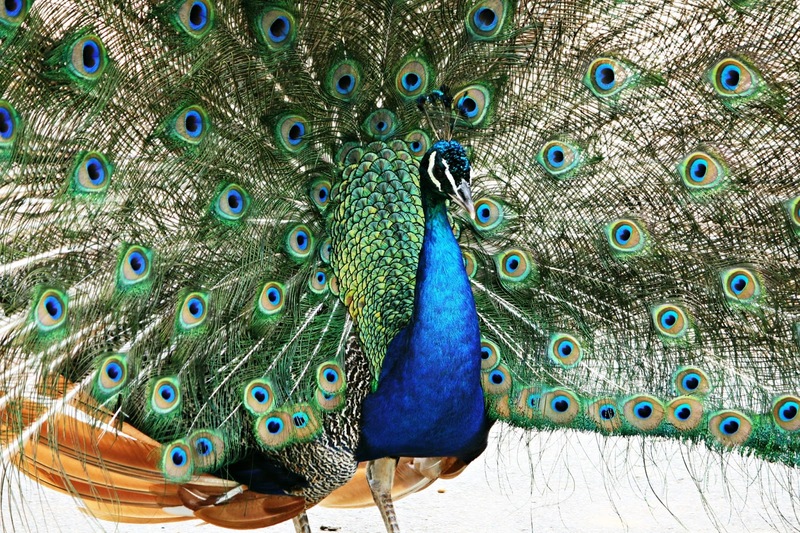 That is such a beautiful photo of a peacock. I've only seen them at the zoo and I'm still amazed at their colors. Hope you had a great 4th!